This entry was posted on January 26, 2010 at 10:36 am	and is filed under columnists, Comm371, sports. Tagged: Comm371. You can follow any responses to this entry through the RSS 2.0 feed. You can leave a response, or trackback from your own site. This semester, I will be following Grant Wahl of Sports Illustrated. Wahl covers both soccer and college basketball and authored “The Beckham Experiment,” chronicling David Beckham’s move to Major League Soccer and Beckham’s impact on soccer in the U.S.
Wahl is currently in Angola covering the African Cup of Nations. The tournament concludes Sunday with the final between Ghana and Egypt. In this article Wahl details how off-field politics and violence impacts the tournament. Graham covers all four teams in the AFC East: New York Jets, Miami Dolphins, Buffalo Bills and the New England Patriots. Graham writes about the teams’ ongoings during the offseason including updates on players, injuries, staff hirings and firings, etc. His writing style is like typical online blogging style, short paragraphs but it does include his opinions in some posts. he also sometimes answers readers’ questions. Simmons does not cover sporting events. He typically makes predictions on sporting events, and does his “mailbags” where he responds to e-mails that readers have sent in. He typically takes a satirical approach to writing, making pop culture references and jokes as he writes about sports. Simmons does not try to hide his bias, as he grew up in Boston, and is a die-hard fan of the Celtics, Patriots and Red Sox. However, his bias provides an interesting contradiction to the standard analysis of sports. Simmons also does podcasts, where he has a guest on to talk about sports, which are posted on his website. Steinberg is a professional sports writer for the Post. He writes and covers the Redskins, Wizards, Capitals, and local college teams. He is also writes his popluar blog called the “DC sports Bog”. This blog is based on stories about D.C area teams and special features on athletes. His writing is mostly online blogging style. It has a lot of links posted and videos are share there as well. He also interacts with readers on a weekly basis. I will be following the Jeff Zillgitt’s blog from USA Today. 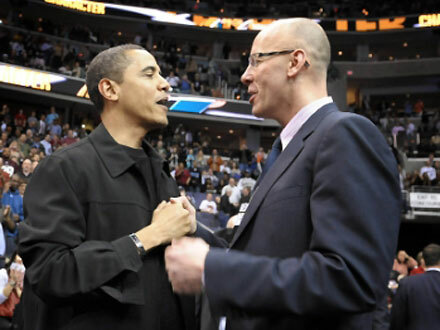 Zillgitt blogs about the the big stories surrounding the National Basketball Association. His writing style is typical online blogging style with plenty of short paragraphs. His blogs include inside NBA stories and links where you can find more stories about the athletes or teams mentioned in his blog. In his most recent blog he talks about the gun controversy surrounding Gilbert Arenas and Javaris Crittenton of the Washington Wizards. I look forward to sharing my opinions and analyzing Zillgitt’s blog. My blogger is Matt Mosley from ESPN’s NFC East Blog. Mosley Blogs about what is going on in the NFC east. He covers The Redkins, Cowboys, Eagles, and Giants. He has other blogs as well but this is the one I choose. Mosley knows the facts of the NFL and he gives them while giving his opinion on them. It makes it easy for me to keep up with what The Redskins are doing and see someone else view point on the situations. Mosley is smart and fun to read. Some of you might agree!! Mosley Blogs about what is going on in the NFC east. He covers The Redskins, Cowboys, Eagles, and Giants. He has other blogs as well but this is the one I choose. This semester I am going to be following sports columnist Bob DiCesare. He is a writer for The Buffalo News. He blogs about all things sports. He does not just focus on Buffalo players but all sports teams. He is pretty honest about his talk and perpetuates a good sense of knowledge about the field of sports. He is sharp and to the main topics. “Bill Plaschke, a sports columnist at the Times since 1996, has made nationally recognized contributions in both journalism and public service. Plaschke was recently named Man of the Year by the Los Angeles chapter of Big Brothers/Big Sisters for his longtime involvement as a Big Brother. He has also received a “Pursuit of Justice” award from the California’s Women’s Law Center for his coverage of women’s sports. In 2002, Plaschke was selected to carry the Olympic Torch for a couple of blocks through downtown Los Angeles as it worked its way to Salt Lake City for the Winter Olympics. Plaschke is also a regular panelist on the ESPN daily talk show, “Around The Horn” and made his film debut with three lines in the Will Smith movie, “Ali.” In what some more cynical colleagues considered a stretch, Plaschke played the part of a sportswriter. The blogger I will be following is Henry Abbott from ESPN’s TrueHoop Blog. Abbott founded TrueHoop, which is a blog all about the NBA. Abbott uses many metaphors and persuasive jargon in his blogs. I’ve noticed he can take the smallest aspects of any NBA game and make a interesting story out of it. I also noticed the he uses many orphan quotes in his leads and headlines. I think that is a big part of him establishing his voice. He is a consistent writer and in every blog you read, it almost feels like one of your friends is just talking to you. I love the way he thinks and I think that TrueHoop will be a very interesting read this semester. Jack Bell is a weekly writer for the New York Times soccer column. He has a lot of experience with soccer because he has played, coached, and written about soccer for more than 40 years. He is also the father of two soccer-playing teenagers who are Manchester United fans. Bell also has written for soccer publications including FIFA Magazine, Striker and Futbol Mundial. Sam Borden wrote a short but sweet blog today, Feb. 1, about his partner, the Johnny Damon saga, Phil Hughes and errors. He wished his partner, Chad Jennings, a nice week off, spoke about how Johnny Damon is no longer with the Yankees, picked Phil Hughes to win the fifth starter job and said that missing a call is a physical error. Although this article isn’t full of baseball information and news, it helped me examine his writing style. I noticed that he used bullet points to state some of his ideas and bolded the words that he wanted to stress. He used commas appropriately and his paragraphs were no longer than 4-5 typewritten lines. Sam’s blog lacks wordiness and is clear and concise. I didn’t see any spelling or grammar mistakes, which must mean that he reread, revised, rewrote and proofread his material! The columnist/blogger that I chose to follow this semester is Bob Ryan. Bob Ryan is a columnist for the Boston Globe and also has his own blog. He is also known for his Globe.10 show on the New England Sports Network. Ryan mostly focuses on basketball, primarily the Boston Celtics, although he covers all areas of sports. Ryan’s latest column is on the Boston Celtics recent win over the Lakers. He discusses how the Celtics were holding a double-digit lead and lost their power in the fourth quarter. Although they still won, barely, it seems to be a reoccuring problem for the Celtics to close-out a game. I am excited to follow Bob Ryan’s columns on a regular basis. I think he is a great writer and always full of energy. The columnist that I chose is Sally Jenkins. Jenkins writes for The Washington Post as a sports columnist as well as feature writer. In 2002 she won the Associated Press’s Columnist of the Year Award. She has also worked for Sports Illustrated, and has written a number of successful books, including “It’s Not About the Bike: My Journey Back to Life,” which highlights the life of Lance Armstrong. In her latest column, titled “Tebow’s Super Bowl ad isn’t intolerant; its critics are,” Jenkins addresses a debateable, pro-life advertisement featuring Heisman Trophy winner Tim Tebow of Florida that will run during the Super Bowl this coming week. She talks about how critics find the advertisement highly inappropriate because of the touchy message it sends, particularly at a time when so many people will be tuned in to watch. Yet she discusses the irony in how critics may call that ad inappropriate, when at the same time it is socially acceptable to watch ads with women in bikinis drinking alcohol. I think it’s important that we address issues such as abortion during peak television watching times like the Super Bowl. I also think we’re lucky to have a stellar athlete as genuine as Tebow to be a part of these ads. I think the critics are wasting their time arguing over his pro-life ad. The subject at hand is obviously a touchy subject, but in no way do I think that means we need to avoid it altogether. The deadline for this assignment has passed. Where are the other 11 of you??? afterward you will definitely get good know-how. need many followers. Even if that style is posting photos without effects or editing. It will ask you if you would like to sign up or sign in. block for online marketing specifically for organic search engine optimization methods for the day. to the principal axes of training and regional cell differentiation. Bulbs need to be planted about six weeks before the first frost. Also you should have a budget in mind of how much you want to spend on the impersonator. not have vocals of the person they are impersonating. A fantastic time Saturday night. We surprised my parents and they were thriled when they got there..Thank you! I was told by the photo booth person that footage would be online. Where are they? Major thankies for that blog site put up.Really hunting forward to read through far more. Awesome.